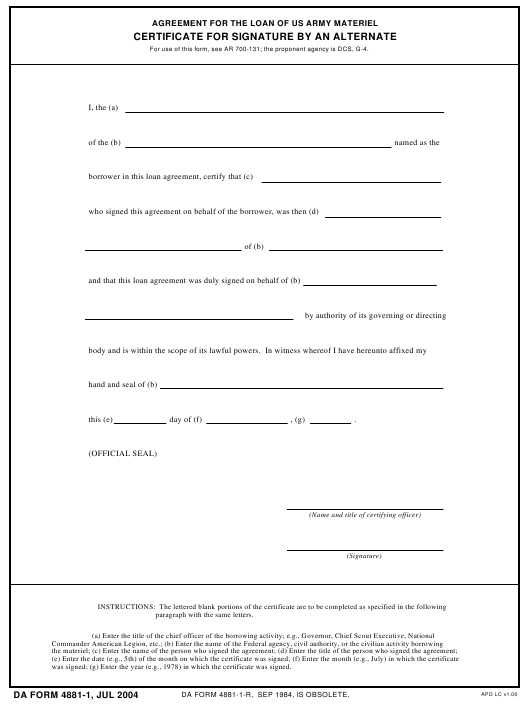 DA Form 4881-1 or the "Agreement For The Loan Of Us Army Materiel Certificate For Signature By An Alternate" is a Department of the Army-issued form used by and within the United States Military. The form - often incorrectly referred to as the DD form 4881-1 - was last revised on July 1, 2004. Download an up-to-date fillable DA Form 4881-1 down below in PDF-format or look it up on the Army Publishing Directorate website. paragraph with the same letters. was signed; (g) Enter the year (e.g., 1978) in which the certificate was signed. DA FORM 4881-1-R, SEP 1984, IS OBSOLETE.